With our E-CLO™ Stretch Slack, we make looking great incredibly easy. Who would have thought a fabric that looks and feels this good could be machine washable. Knowing they were made from recycled water bottles will make you feel good. E-CLO™ Stretch Slack - Heathered Plaid is rated 4.4 out of 5 by 18. Rated 5 out of 5 by TroyOC from great value! 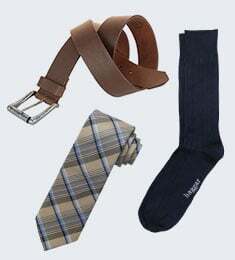 I am a major fan of the haggar product. 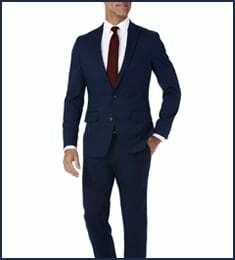 I'm 36x36 slim and the slim fit pants are great. I used to wear the classic fit but just dropped too much weight. The E-Clo fabric is a light, summer weight fabric. The leg is a little tigher than i would like it but that's a picky comment. the pants fit great, the stretch waist is awesome. I wear the pants with my custom made coat. I feel like i'm making no compromises on price vs looks. The pants work all day and they look great. Rated 2 out of 5 by WSB8112 from Look great, but too small. These 38-32s are good looking. But, the fit is much much smaller by about 1-2 inches in the waste and no ability to adjust. Rated 4 out of 5 by Noname2 from Tags The tags are held on the pants with plastic pieces. I have bought 6 pairs of Haggar's slim pants. You are able to see the holes in the fabric where these tags are cut off. The material is so thin....which is ok....but I don't like that you can see, even after washing, these holes. I can't believe you haven't heard this complaint before. I do like the pants though. It is hard to find a slim that fits my husband as good as these. Rated 5 out of 5 by Deee from Perfect! I bought this for my tall slinder son for Christmas. He loves them. They are the perfect fit. 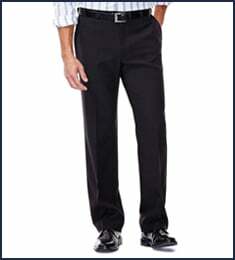 The pants are also great quality and don't wrinkle easily. I will always by these pants for him. Rated 5 out of 5 by Em Bee from Looks better than what I paid! Pants ordered online and received within the timeframe denoted at time of order. Fit is perfect (and I am far from a perfect body). Comes with a return address sticker if you are not happy. I did not need that. Very satisfied. 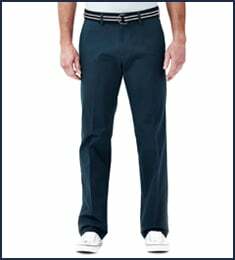 Rated 5 out of 5 by Pkins from Super lightweight If you’re looking for lightweight summer pants you can’t beat these on cost or feel. Rated 1 out of 5 by Jhubers from Wrinkle easily Washed these once and they are a wrinkled mess. Sending the. Bsck for a refund.